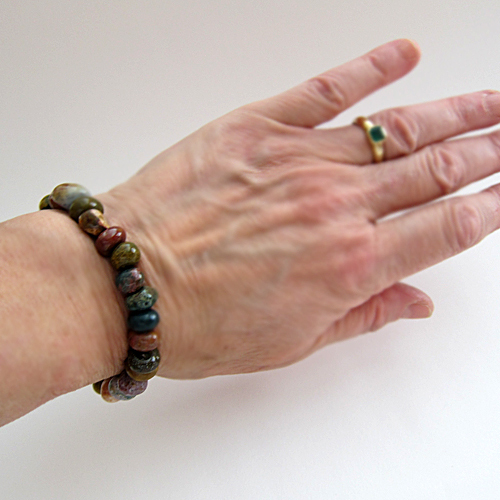 This fabulous Multicolor Mixed Jasper Power Bead Bracelet displays a multitude of colors and patterns creating a soothing, painterly surface. The color range includes umber, green and blue-green primarily. 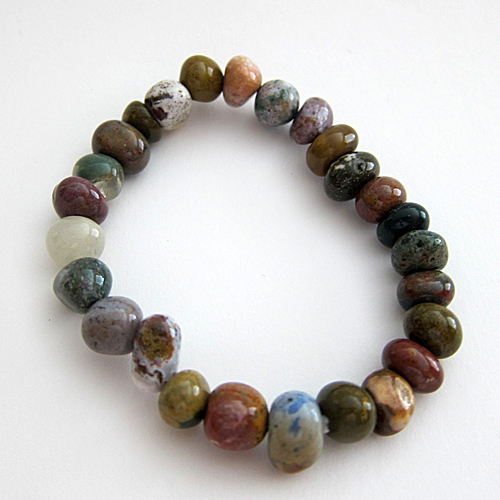 This beautiful bracelet provides a buoyant, uplifting energy. Its vibrant colors call us to become more conscious of the joy in living, and to experience a more playful attitude toward everything we do. Jasper containing red has been used as a stone of protection during threatening times, and as a physical restorative. Jasper containing white has been used as a Spirit stone, to connect with the Wisdom of Ancestors, Guides and Teachers. Jasper in all its forms, colors and patterns, helps us to connect with the Rain Cloud of 10,000 Knowable Things that resides in the collective unconscious of humanity, helping us to creatively communicate the timeless truths of existence in symbols, myths, stories, dance, pictures, and song that are in tune with the current "zeitgeist", the Spirit of the Age in which we live. You may also be interested in the article, "Using Quartz Crystals in Digital Technology, Healing and Meditation" for an overview of the metaphysical and mineralogical properties of quartz, and a step-by-step guide explaining how to cleanse, charge, and program quartz crystals for healing, meditation and other spiritual purposes. Note: Above is shipping weight. Average Net weight is .6 ounces.